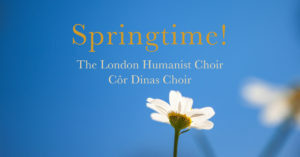 We have been invited to take part in the prestigious Brandenburg Choral Festival of London, and we're performing in a joint concert with Côr Dinas Choir on March 2nd. We'd love you to come and hear us at St Botolph-without-Bishopsgate church and you can save £3 when you book via the ticket link given, remembering to use code CHOIR1 at checkout. Please book via the ticket link you'll see above - this helps the choir as our sales are tracked and we have a target to hit! Remember to enter code CHOIR1 to get your discount.